Chung or glutinous rice square cake is a traditional Vietnamese cake, commonly sold in markets and supermarkets at about 2 USD each. However, with a love for the cake and a desire to turn it into a high quality gift, a young girl in Hanoi has devoted time to giving chung cake a new look. Chung cake is an indispensible food for the traditional Tet (lunar New Year) festival in Vietnam. Besides Tet holiday, chung cake is also eaten year-round. However, not many people buy chung cake as a gift due to its unattractive appearance. What’s more, the traditional flavour is being lost due to massive production. Thu Hoai, who founded Nuong Bac establishment, decided to improve the cake’s quality and appearance to turn it into high-quality gift, worth VND600,000 (USD26) each. 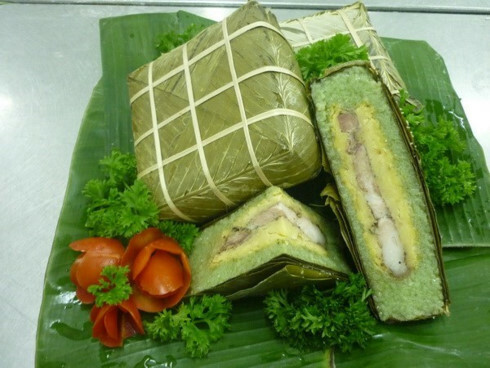 Chung cake is made from glutinous rice, mung beans, pork and other ingredients. The cake is wrapped in phrynium leaves. Thu Hoai makes the cake special by using organic pork. She also restores the tradition of using galingale leaves for dying the rice green. Thanks to improvements from production to packaging, Hoai’s cake has gained a firm foothold in the market. Vu Quoc Anh, who bought the cake, said:"I bought a pair of Nuong Bac chung cakes a as gift for Tet holiday. The cake is delicious and suitable for use as a gift." Apart from giving a new face to Vietnamese traditional food and promoting its image, Hoai also wants to create jobs for disadvantaged women. "I have developed a system of agents who are women. I want to set up workshops to develop traditional products with the participation of vulnerable women," said Hoai. Hoai’s efforts have helped bring more added value to Vietnamese traditional chung cake. It is hoped that in the future, the cake will be sold and favoured in foreign markets.